Park Moo-Jin ( Park Hee Soon) and Kang In-Ha (Choo Ja Hyun) are a married couple. Park Moo-Jin works as a high school teacher and Kang In-Ha runs a bakery. They enjoy their lives with their children. Their peaceful days soon turn into a hellish experience. Their son, who is in the 3rd grade of middle school, is seriously injured due to school violence. Park Moo-Jin and Kang In-Ha try to reveal the truth. Park Hee-Soon, Choo Ja-Hyun, Oh Man-Seok and Cho Yeo-Jeong are cast in JTBC drama series “Beautiful World” (literal title). Park Hee-Soon and Choo Ja-Hyun will play a married couple whose son is seriously injured at school due to violence. Oh Man-Seok and Cho Yeo-Jeong will play a wealthy married couple. Their son is a troublemaker. “Beautiful World” first airs April, 2019 (takes over JTBC’s Friday and Saturday 11pm time slot after “Legal High“). Actors Park Hee-soon, Cho Jae-hyun, Oh Man-seok and Cho Yoon-jung confirmed the cast in JTBC's new drama 'Beautiful World' scheduled for airing in April. It meets as parents vs. parents around school violence. I like the cast, especially Park Hee Soon and Oh Man seok. The drama deals with a serious issue, shool violence. I will watch. JTBC’s upcoming Friday-Saturday drama “Beautiful World” (literal translation) has confirmed the casting for its lead roles. “Beautiful World” is written by Kim Ji Woo and directed by Park Chan Hong and tells the story of a boy who stands on the precipice of life and death after an incident of school violence and his family who seeks the truth in his name. The title refers to the search for hope even in a selfish and insensitive world full of lies, hiding, distrust, and violence. Park Hee Soon and Chu Ja Hyun have been cast as the victim’s parents, Park Moo Jin and Kang In Ha. Their child is in his third year of middle school. Park Moo Jin is a high school physics teacher and Kang In Ha operates a bakery that has her son’s name on it. Although their life together is ordinary, they are satisfied and happy. But when Kang In Ha wants to move to a neighborhood with a better school for her son, despite her husband’s cautions that a prestigious university isn’t all to be had out of life, their ordinary lives turn to hell overnight. Oh Man Seok and Jo Yeo Jung have been cast as the attacker’s parents, Oh Jin Pyo and Seo Eun Joo. Oh Jin Pyo is a graduate of Seoul National University and inherited the position of chairman of a private school foundation. Seo Eun Joo is a housewife who has lived all her life in a wealthy family. They got married and had a child in rapid succession after an arranged meeting. Because they have never lacked for anything in their life, they are insensitive to other people’s pain. When their son gets in trouble, they are quick to cover for him and even fully believe that there are no problems with their son. It’s been a long 4 years since actor Park Hee-soon (Missing Noir M) was last in a drama, and he has confirmed that he will be returning to dramaland in JTBC’s upcoming melo, Beautiful World. A terrible incident takes place in which a student becomes critically injured in an act of violence at school. The family of the student then begins to seek out the truth and attempts to uncover what happened. Though the world is a chaotic place of deceit and callousness to other people’s sufferings, the drama will strive to find a “beautiful world” in which everyone can embrace one another’s emotional scars and pain. Park Hee-soon will be taking the role of the victim’s father, Park Moo-jin. His character is a high school physics teacher who’s an easy-going optimist with a peacekeeper mindset. His main goal in life is to be a great father and a great person. Thus far, the family has led a normal and happy life. However, their peaceful life is uprooted overnight when their son is assaulted at school. Actors Nam Da Reum and Kim Hwan Hee confirmed to join drama "Beautiful World" playing brother and sister, Park Sun-ho and Park Soo-ho . Young actors Nam Da Reum and Kim Hwan Hee have been cast in JTBC’s upcoming drama “Beautiful World” (literal translation). “Beautiful World” tells the story of an incident of school violence which leaves a young boy on the precipice of life and death and his family fighting for justice in his name. Previously, JTBC had announced the casting of Park Hee Soon, Chu Ja Hyun, Oh Man Seok, and Jo Yeo Jung as the parents in the drama. Nam Da Reum and Kim Hwan Hee will be playing brother and sister, the children of Park Hee Soon and Chu Ja Hyun’s characters. Nam Da Reum’s character, Park Sun Ho, is in his final year of middle school when he becomes a victim of school violence. Kim Hwan Hee’s character, Park Soo Ho, is a year younger than he is at the same school. The two siblings get along well, but when tragedy strikes, Park Soo Ho decides to seek the truth behind her brother’s attack in her own way. On December 28, DeMost Entertainment said, "Hwang Tae - gwang has confirmed his appearance in 'The Beautiful World' and has recently finished reading the script. Seo Dong-Hyun took on the role of Oh Jun-seok, the son of Oh Jin-Pyo (Oh Man seok) and Seo Eun-Joo (Cho Yeo Jeong). Oh Jun-suk is known as a schoolboy in the school and is a popular character for his children as a confident leadership. However, because of the authoritarian and repressive manner of the father and the overprotective tendency of the mother, it becomes increasingly skewed internally. oh this show sounds good and its JTBC which have been doing amazing lately. Actor Jung Jae-sung appears in the drama 'Beautiful World'. Actor Jo Jae-Ryong has joined the cast of JTBC drama "Beautiful World' and he will play the role of Park Seung-man, a powerful team detective in charge of the case of Park Sun-ho. @larus Thanks much for this thread. I love the cast. Anticpating this already. This is a serious drama. I like serious drama. I post a lot, do recap, share thoughts. My choice of dramas to watch has never failed me. Nam Da Reum had a scene in that drama where he was about to commit suicide. and jump off a school building. As for Seo Young Joo.. in JTBC Solomon's Perjury ( one my favorite). He jumped off school building and commited suicide. Indulge me while I gush. It's always good to see terrific acting from young actors. The 3 youngs stars has Immense talent. Not only the whole cast is good but I expect a good story as well. It is a serious drama, indeed. “Beautiful World” is now scheduled to first air Friday, April 5, 2019 in South Korea. @larus Hopeto see SeoYoung Joo poster too! thanks for the update. Looking forward to this drama. First teaser trailer for JTBC drama series “Beautiful World” starring Park Hee-Soon, Choo Ja-Hyun and Nam Da-Reum. The teaser trailer show Nam Da-Reum as high school student Park Sun-Ho. He appears to be blissfully listening to music, but the camera pans out and shows that he is injured. 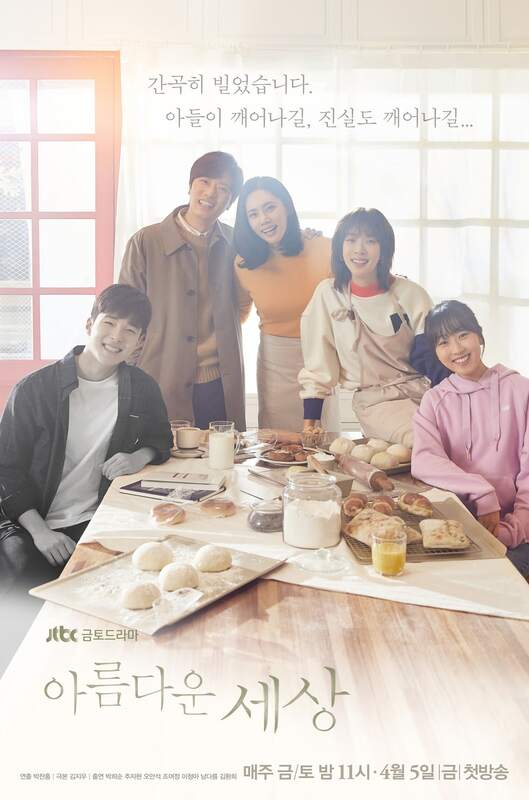 A song plays in the background with lyrics in Korean that says “Let’s make a Beautiful World together, Beautiful World.” The drama series will likely draw comparisons to hit JTBC drama series “SKY Castle,” due to its depiction of parents and their children. “Beautiful World” first airs April 5, 2019 in Japan. JTBC has revealed the first preview video for a drama that tackles the topic of school violence. On March 1, the network released a teaser for “Beautiful World” (working title), which focuses on the story of a young boy who is the victim of school violence. His family fights for justice and tries to reveal the truth as he lies on the brink of death following the incident. In the video, actor Nam Da Reum (playing the boy Park Sun Ho) is lying on the ground with his eyes closed as though taking a nap in the sunlight. Through his earphones, we hear the sound of the children’s song “Beautiful World.” As the camera pans out, blood pools around his head, revealing what appears to be the aftermath of an attack. Park Sun Ho is the son of Park Moo Jin (played by Park Hee Soon) and Kang In Ha (played by Choo Ja Hyun), and he’s in his third year of middle school. He’s friendly and easygoing like his parents, always positive, and considerate like many other eldest children. However, one day his closest friends begin to pressure him, and soon he’s no longer smiling like he used to. Thanks larus for updates. Waiting for this drama. To be honest the last youth dramas I enjoyed included Seo Young Joo. And that's excellent "Solomon's Perjury" and "Lingerie Girls". I like excellent Nam Da Reum he's the lead here and I'm fan of his but I love Seo Young Joo. He's a really brilliant young actor. Check his work credentials. If you've seen his last two dramas and his movies. you'll see what I mean. Found this DB article. And thanks to one of the comments (cr: sparks121), I found what Seo Yoing Joo's character would be. "Translating what's been released in articles: His character is han dong soo. He grew up in a bad environment, doesn't have any hopes or dreams for the future, and is considered a troublemaker by adults. He doesn't have any parents so he works a lot of part-time jobs"
I said previous post., In Solomon's Perjury he committed suicide and jump off school building. This time I think it's Nam Da Reum's character who's going to do that. I wonder if we're going to have boys friendship tested or something like that. I'm going to ask myself thae question,, in which episode will my tears fall? I asked that when I watched Memory drama because I cried in the scene where NDR tried to jumped off the school building. I know right these boys previous roles. I just know I'm going to see the future best actors in this drama. Future Daesang awardees. NDR and SJY and KHW all are best actor awardees! SJY won a TIFF best actor award. @larus, thank you for starting the thread. I super look forward to this drama. Superb cast! Please make sure to submit license request forms to Viki. JTBC just posted some character posters.